So, do you ever get in one of those moods where you're just obsessed with something? Yep, me too! Lately, it's been Polyvore (again!). It started a couple years back when I found Polyvore. I just love putting outfits together. I don't always publish them but I do create outfits/designs and write things down, which gives me ideas for jewelry designs and other things as well. 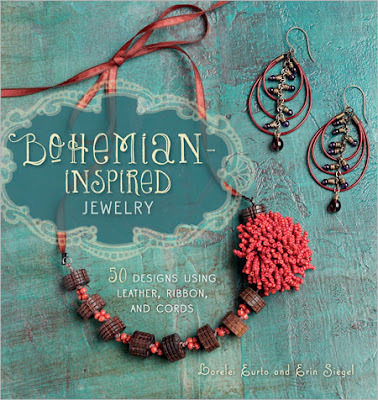 But recently, due to the Beading Daily Polyvore Challenge and blog hop that was this past weekend for the new book by Lorelei Eurto and Erin Siegel, "Bohemian Inspired Jewelry", I've been completely and utterly obsessed! First, Erin and Lorelei's book is one of my favorites. You can check it out here. The photos are so gorgeous and you can really see yourself wearing these designs - no matter what your style! However, being up at my sis's cabin this past week and weekend, I kinda missed out on the whole challenge thing and didn't get to really go to all the blog posts of everyone who was involved in the book tour blog hop, but I'm slowly making my way around this week and next. And, it's not too late for your to get in on the Beading Daily Challenge either - you've got until July 13th I think it is - go check it out! You need to hop on over to Polyvore too and check out all the great collages and ensembles that everyone's putting together - sweet!! 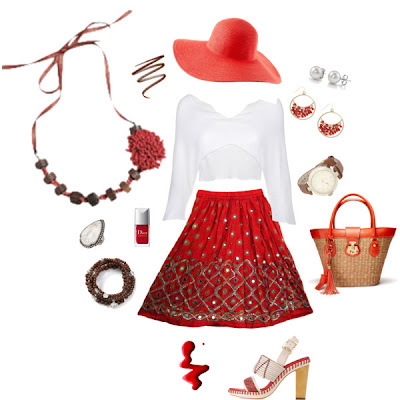 I actually put together two sets on Polyvore that I could never in a million years pull off wearing. But, they took me out of my comfort zone and expanded my thinking a bit - which was fun and interesting! Nope, not me in the least! Well, maybe the shoes - definitely the shoes! The Red Set is totally my girlfriend Lea, though!! Okay - here's where I'm going with this. My thoughts are that you've been stuck in a rut before with designing or with your hobby or with decorating your house (Pinterest has great ideas for this by the way!) 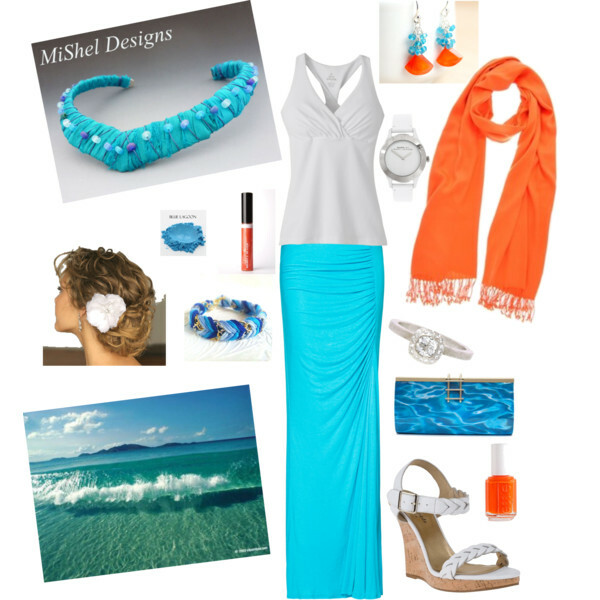 and Polyvore is a really good jumping off point to spark your creativity and it's free! You don't have to 'share it' if you don't want to and you don't even have to save or publish the sets you create - so it's totally 'risk free'. Kinda like that no-calorie candy bar they tell you about, only this time it's true!! What types of things have you found that helps you step out of your normal comfort zone and into something else but still allows you to be creative is some way? Has it opened up new avenues for you? Does it relax you enough to open your mind to other creative venues? Maybe it just sparks new interests for you and you start noticing things you haven't before - like different colors, new styles, etc. I hope you're enjoying your summer and refueling yourself with creative endeavors. Be sure to stop by and tell us all what's going on and what cool, creative things you're up to or that you're getting ready to try. Oh, and I'm having a little SALE over in my MiShel Designs Etsy shop this week - 25% off your total purchase from now until July 1st. Use coupon code SummerFun25 during the check out process. I don't have the code listed in my shop announcements because it's just for my blog and FB friends - so enjoy!! Peace, Love and Creatively Obsessed!! Hmmm...do I need another distraction/addiction in my life right now?? You make Polyvore sound and look like so much fun! Love your collages, Shel. They really show off your eye for design.